Last major update issued on January 26, 2005 at 05:20 UTC. The geomagnetic field was inactive to quiet on January 25. Solar wind speed ranged between 390 and 563 km/sec. Solar flux measured at 20h UTC on 2.8 GHz was 94.1. The planetary A index was 4 (STAR Ap - based on the mean of three hour interval ap indices: 4.3). Three hour interval K indices: 10111121 (planetary), 11212212 (Boulder). Region 10723 was quiet and stable. Region 10727 developed further adding spots and penumbral area. The region currently does not appear to be complex magnetically. C flares are possible. New region 10728 emerged in the southeast quadrant and has a single tiny spot. 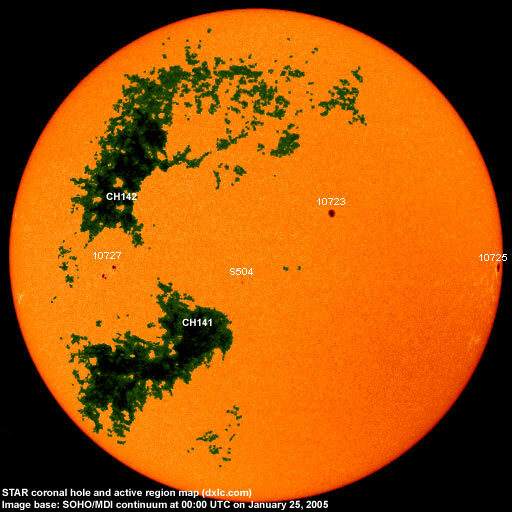 January 23-25: No obvious fully or partly Earth directed CMEs were observed. 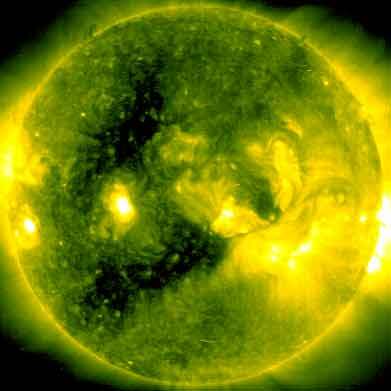 A coronal hole (CH141) in the southern hemisphere could rotate to a geoeffective position on January 25-26. A recurrent trans equatorial coronal hole (CH142) will likely rotate to a geoeffective position on January 27-29. Processed SOHO/EIT 284 image at 01:06 UTC on January 26. The darkest areas on the solar disk are likely coronal holes. The geomagnetic field is expected to be mostly quiet on January 25-27. 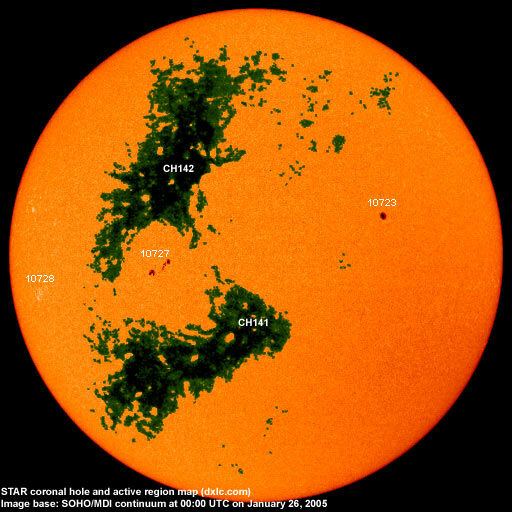 On January 28-29 a high speed stream from coronal hole CH141 is likely to cause unsettled to active conditions while effects from coronal hole CH142 could extend these conditions until February 1. Long distance low and medium frequency (below 2 MHz) propagation along east-west paths over high and upper middle latitudes is poor. Propagation along long distance north-south paths is very poor. Trans Atlantic propagation conditions are normally monitored every night on 1470 kHz. Dominant station tonight: Radio Vibración (Venezuela) with a very weak signal. Interestingly Greenland was heard on 650 kHz with a strong signal, at my location this is usually a sign that more northerly signal paths are opening.